Unique plastic pieces, no glue required! 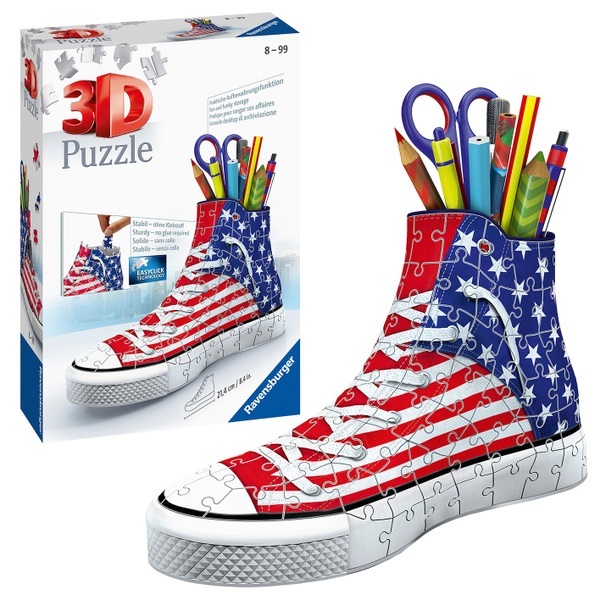 Now you can make this very cool looking American Flag Sneaker 3D Puzzle. When it is complete, you will have a very handy and practical pencil holder to display! High quality 108 piece plastic jigsaw puzzle. The finished American Flag Sneakers puzzle measures 21.3 X 8.7 X 13.4cm high when complete. This puzzle uses unique plastic pieces, which slot together to build this sturdy and strong model. No glue required! Each American Flag Sneakers puzzle piece is printed with a number on the reverse side, so you can either assemble the puzzle by eye, or just by following the numbers.